PRAGUE- I was transmitted into so many lives that were in pictures. But I was, also, transmitted into the photographer’s life and senses without even having him in any of frames. A walk through 350 black and white photographs forces you to feel and experience everything the man behind the camera felt and faced. 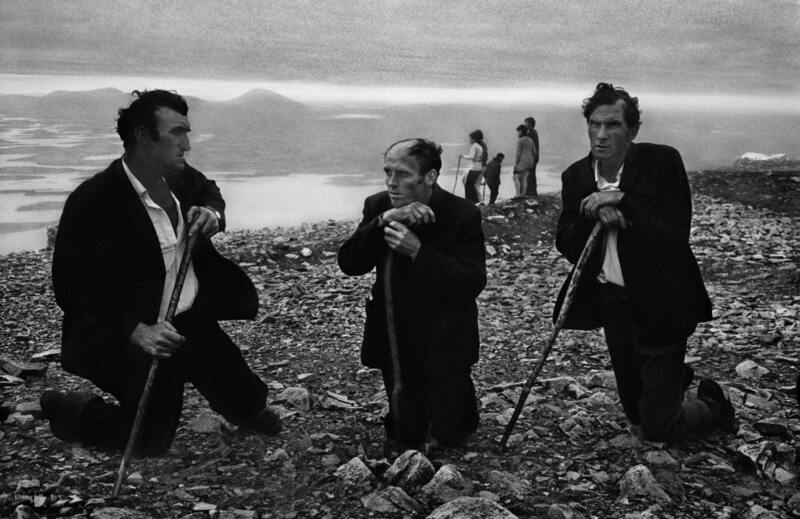 Through strange places and faces, Josef Koudelka conveyed his astonishing yet overwhelming journey. 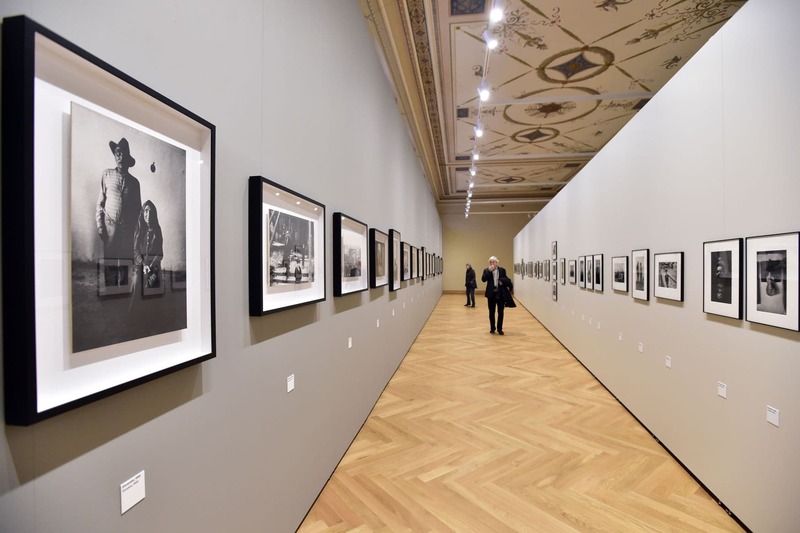 Koudelka: Returning exhibition at the Museum of Decorative Arts, in Prague- Czech Republic, is a retrospective cross-section of the photographer Josef Koudelka’s life’s work. The 350 black & white photographs were from Koudelka’s famous series: Experiments, Beginnings, Theatre, Gypsies, Invasion ‘68, Panoramas, and Exile. Along the photographs there were articles, photography books, a large bibliography, and original photo prints that were never seen before. 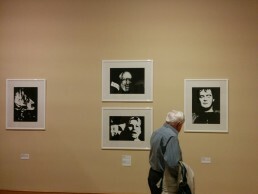 The exhibition told Koudelka’s uneasy story. A story of freedom, beauty, isolation, and struggles. Interior view of exhibition, Gypsies series section. “The maximum, that is what has always interested me.”- Josef Koudelka said according to Magnum agency. 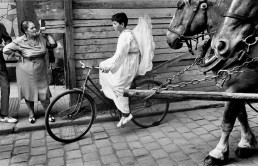 Koudelka was born in 1938 in the Czech Republic. He became a photographer when he was twenty-three years old while starting a career in aviation engineering. 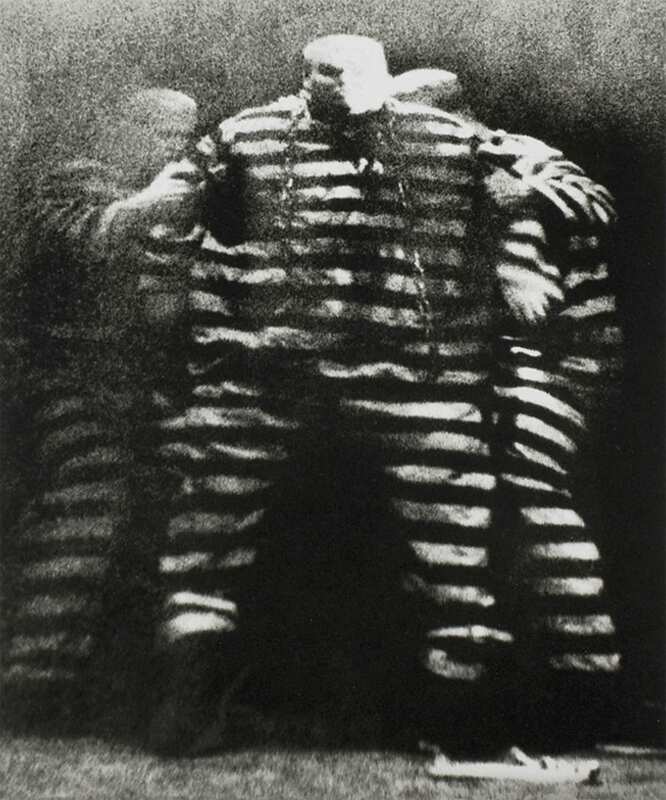 He started experimenting with photography by photographing the gypsies in Czechoslovakia and the theater in Prague, in his kickoff series Experiments & Beginnings, which was displayed in the first room at the exhibition. These series comes across more like paintings than photographs. The cause of this effect was the choice of paper material and the development process the artist used, it gave a completely different feeling than when looking at a regular photographic print. Koudelka in his technique obviously loves manipulating light and shadows while developing the images. In some sense, they seemed very surreal and visually striking. 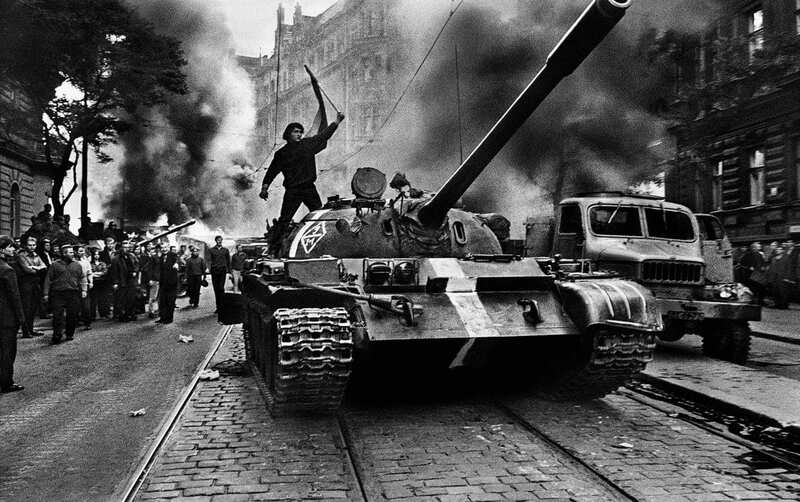 In 1967, When Koudelka was twenty nine years old, just one year ahead of the Soviet invasion, Koudelka became a full-time photographer, where he started his wild and uneasy life voyage. “Suddenly, for the first time in my life, I was confronted with that kind of situation. I responded to it. I knew it was important to photograph, so I photographed. I didn’t think much about what I was doing.” Koudelka said, according to Magnum. 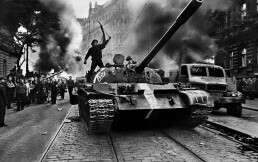 In 1968, Soviet tanks flooded the streets of Prague, ending Prague’s Spring. Koudelka who was never a reporter before that moment took a series of photographs that were meant to be only for him to see. His friend Eugene Ostroff -curator of the photography department at the Smithsonian Institution in Washington-, smuggled some of Koudelka’s negatives of the Soviet invasion, out of Czechoslovakia to New York. 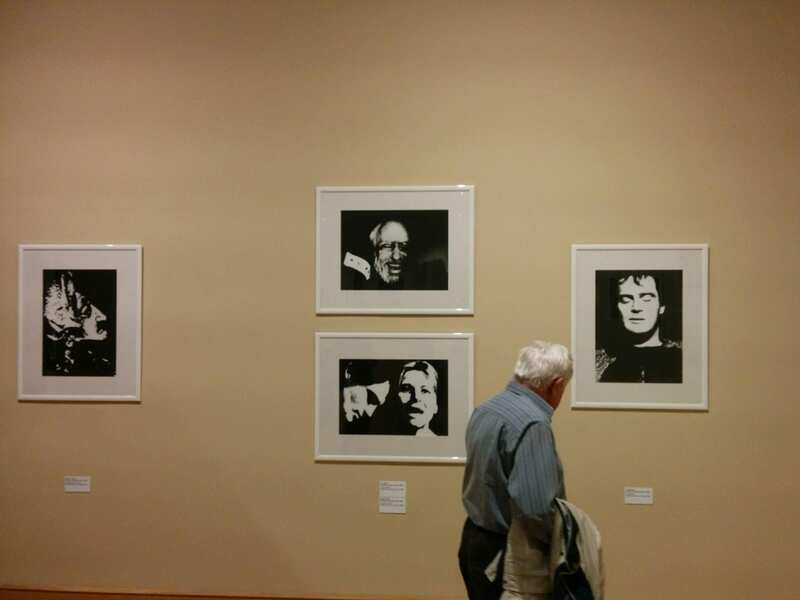 Ostroff then showed the work to photographer Elliott Erwitt, the president of the Magnum photo agency at the time. 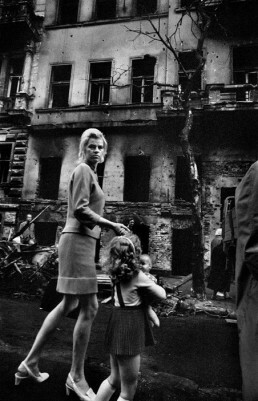 Later on, Koudelka‘s negatives were constantly smuggled to Magnum agency in France, where they were published and distributed to various international news outlets under the anonymous name: PP (Prague Photographer) because he was in fear for his and his family’s lives. 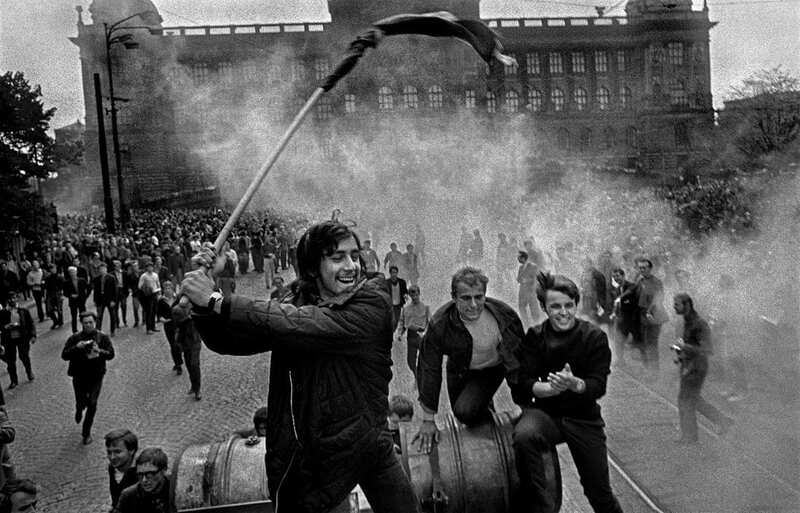 “I think the series of my photographs of the Russian invasion is important as a historical document, it shows what really happened in Czechoslovakia in 1968. 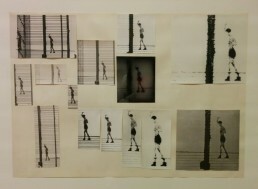 But perhaps a few of the photographs — the best ones — are something more. They are the ones where it’s not important who’s Czech and who’s Russian, the ones where the important thing is that one person has a gun and the other hasn’t. 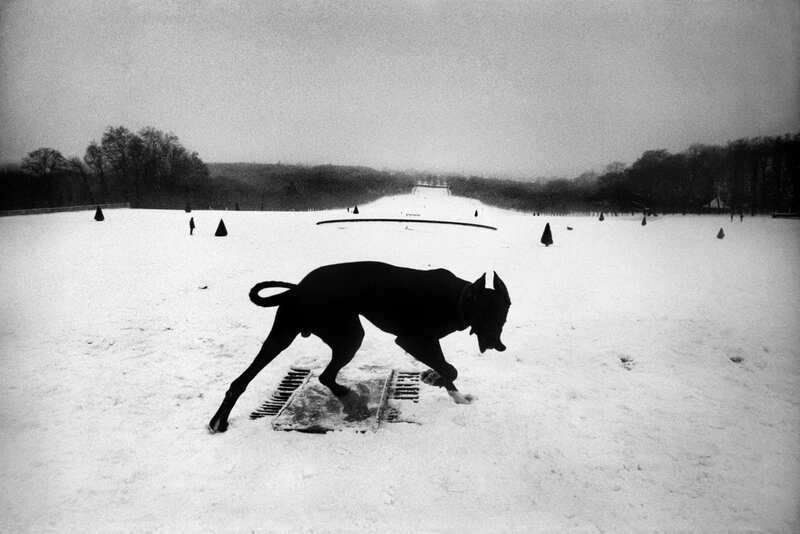 And the one who hasn’t is, in fact, the stronger.” Koudelka said, according to Magnum. 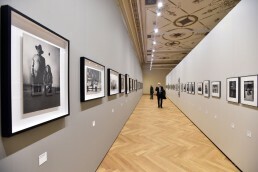 The photographs of the invasion definitely conveyed the secrets of the Czech resistance and struggles and exposed the Soviet Union’s lies and propaganda. Koudelka’s 1968 invasion series was published in Czech Republic twenty-two years after the war. 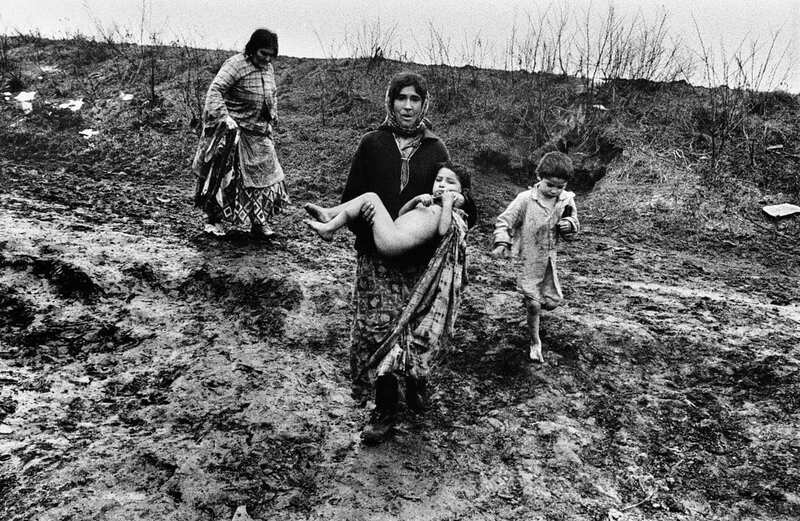 In 1970, Koudelka left Czechoslovakia for political asylum, where he joined Magnum agency and was assigned to photograph the Roma communities in Western Europe. 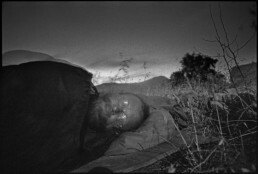 Koudelka continued working on the Gypsy series in France, London, Scottish border, and Ireland, where his exile journey had started. The Gypsy series is one of the most influential photo essays in the 20th Century. Koudelka was able to capture a unique and unprecedented insight into the daily life of the Roma communities across Europe, in the early Sixties and early Seventies. 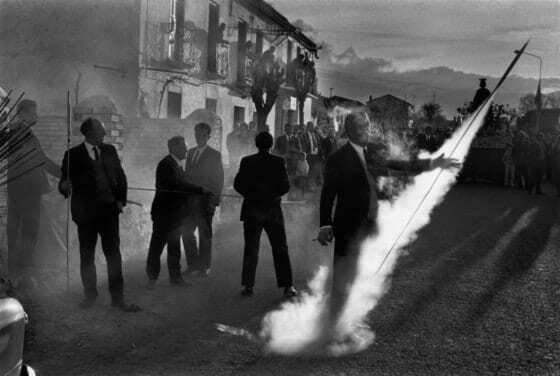 It is also striking how his life was during this long and cruel voyage: Koudelka moved freely between the villages. He was carrying his equipment, backpack, and sleeping bag, and slept outside by himself. Koudelka was completely sunken in and consumed with documenting the people he encountered. Koudelka’s reality made him identify with the Roma communities. He became a gypsy himself living without one place to call home, without any relative or a friend, and without money. With each photograph displayed at the exhibition, you can see how Koudelka was always considered an alien, and how most of his subjects were alone. 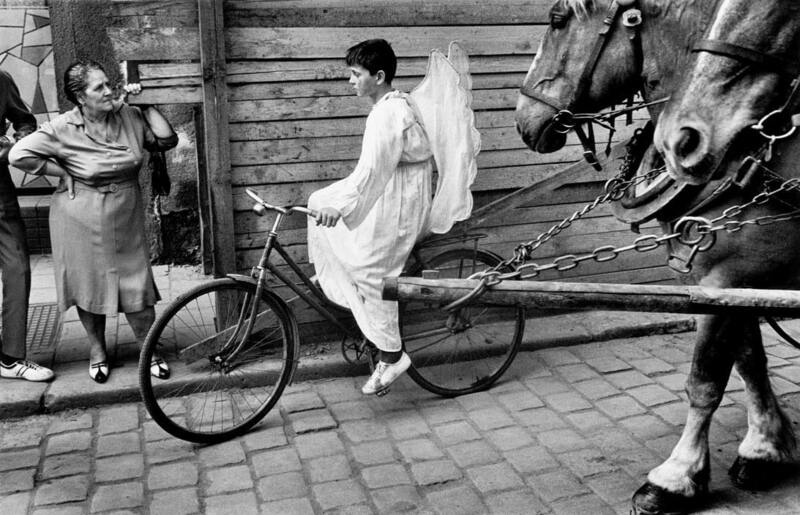 The series did not only transmit the intimacy and complexity of Roma communities, But It also transmitted Koudelka’s melancholic reality. 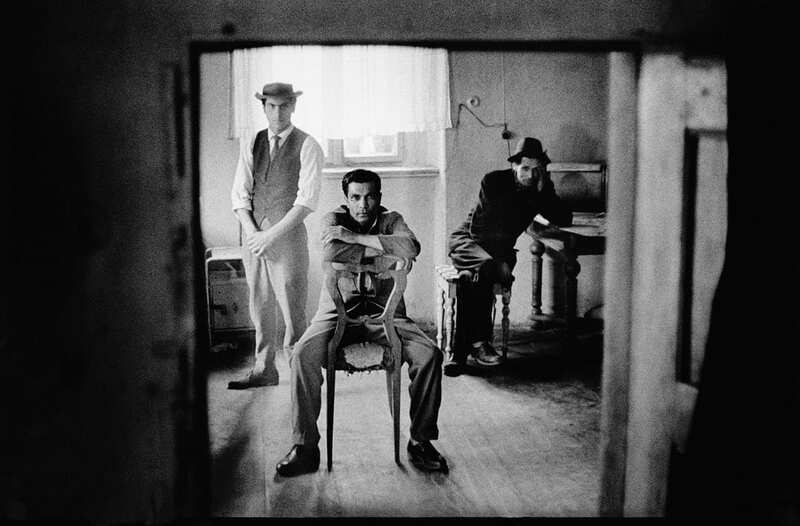 Just like the Roma communities: Koudelka lived most of his life stateless and restless. Koudelka lived in exile for twenty years. He was able to go back to his homeland only after the Velvet Revolution, in 1989. “To be in exile is simply to have left one’s country and to be unable to return. Every exile is a different, personal experience. Myself, I wanted to see the world and photograph it. That’s forty-five years I’ve been traveling. I’ve never stayed anywhere for more than three months. When I found no more to photograph, it was time to go,” Koudelka said, in an interview published by a French newspaper in Le Monde, in 2015. For almost twenty-years of being stateless, Koudelka relied on friends and a network of people that helped him and provided him with a place to stay when he traveled. He was never a regular photographer or photojournalist, all of his photographs and series were meant for his personal study. Everything he captured was destined to be extinct or exiled, just like him. “For fifteen years, I didn’t work for anybody. I never accepted any assignment, never photographed for money. I took photographs just for myself. I lived on the minimum. I didn’t need much: a good sleeping bag and some clothes – one pair of shoes, two pairs of socks and a pair of trousers for one year. One jacket and two shirts lasted me for three years,” Koudelka said in a discussion with Czech author Karel Hvíždala, published in the 2002 book Josef Koudelka. Josef Koudelka started using a camera in a panoramic format in 1986 while participating in the photographic mission of the DATAR, whose objective was to “represent the French landscape of the 1980s”. He thus crisscrossed France, then the entire world, to take stock of modern humanity’s influence on the landscape. He went to Palestine, to photograph the wall, Italy, Germany, Azerbaijan, Lebanon, Romania, and many other places. The exhibition was beautiful, enlightening, and inspiring. Koudelka’s story and work can sound like it’s out of this world or in a reality that’s different from ours, but surely, he captured all of its hideousness and beauty in mesmerizing frames. 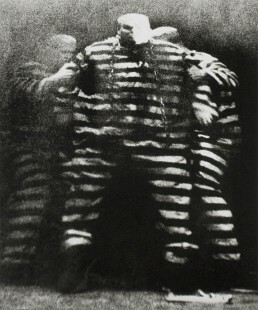 It is no wonder that his work was exhibited in so many places across the world and to also win so many awards including: the Prix Nadar (1978), Grand Prix National de la Photographie (1989), Grand Prix Cartier-Bresson (1991), Hasselblad Foundation International Award in Photography (1992), and more. Read more from Sarah Abu Saad. A photojournalist, a writer, and sometimes a painter. Studying Journalism and Mass Communication at Anglo-American University, Prague, Czech Republic. Passionate about what makes life beautiful: art, music, and nature.